NEWS RELEASE: New huntsville.org aims to showcase Rocket City to visitors, business travelers, Hotel, attraction, restaurant etc. Watch the website teaser video here. We’re the Rocket City, a Gig City, and the website responsible for showcasing Huntsville’s leisure and convention offerings to the world should exceed expectations. It should provide the “wow” factor that visitors to Huntsville and Madison County so often experience when they first arrive. And now it does. The Huntsville/Madison County Convention & Visitors Bureau (CVB), the organization responsible for promoting Huntsville and Madison County as a visitor and meeting destination, unveiled the new huntsville.org today at an event at the U.S. Space & Rocket Center’s National Geographic Theater. This is not a redesigned site. It’s all new. The Huntsville/Madison County CVB hired website company Simpleview to build the site in close coordination with Huntsville/Madison County CVB staff members, community officials and local influencers. Simpleview is the leader in creating Destination Marketing Organization websites. Over 150 destinations worldwide, including Orlando, Chicago, Pittsburgh, Cleveland and Vancouver use SimpleView. The company works with destinations of all sizes to maximize the experience for website visitors and convert them into “on the ground” visitors. The new huntsville.org is full of high resolution imagery, new streamlined and engaging copy – produced by local company Media Fusion – and new functionality, all designed to captivate the online visitor and entice them to make lifelong memories with a visit to the Rocket City. “Madison County currently enjoys approximately 2.8 million visitors a year, and we hope that once prospective visitors see the new website, that number will grow,” Ryals said. Strengthening the Rocket City’s online presence by better representing Huntsville’s diverse offerings is a major piece of the economic puzzle to enhance Huntsville’s prosperity. Visitors and conventions are big business for Huntsville and Madison County. In 2014 alone, the local travel and tourism industry generated over $1 billion for Madison County in economic impact. It’s responsible for over 14,500 local jobs and saves the average household around $650 annually on taxes. The mission of the Huntsville/Madison County CVB is to maximize the economic impact of convention, visitors and business travelers in the community. Fully Responsive: Whether you’re viewing huntsville.org on a desktop, tablet or your mobile phone, the website will size accordingly – looking as if it were made for whatever device you happen to be using. Districts Map: Huntsville has many unique and characteristically diverse parts of town. Think: Jones Valley, Hampton Cove, Research Park, Downtown, Village of Providence and more. The new huntsville.org shows off these districts of the Rocket City like never before. Districts Map (continued): With a Districts map on the homepage and a dedicated information page for each district, the new site allows users to sort restaurants, hotels, meeting space and things to do by districts and area of town. Imagine this: You are a meeting planner thinking of bringing your next convention to Huntsville. You know you need 300 hotel rooms downtown but are curious which restaurants and attractions will be available to your conference attendees. Solution? 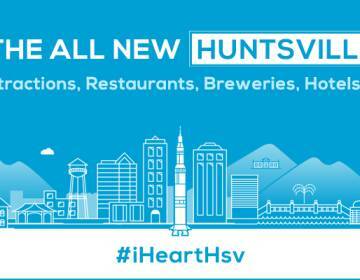 Use huntsville.org to sort offerings via the Downtown Huntsville District. “Social Station” Social Media Hub: Not on all the latest social media accounts? Want to see which social media platforms Huntsville/Madison County is on? Take a look at the homepage of huntsville.org for a live feed of what the Huntsville/Madison County CVB is saying on Facebook, Twitter, Instagram, YouTube, Pinterest and our iHeartHsv blog. Itineraries from local influencers: Partnering with local bloggers and writers in the Huntsville area, 10 itineraries have been written for all types of different visitors and interests. Are you a young professional looking for things to do in Madison County? What about a business traveler here for a brief time? Or a parent traveling with young children? We’ve got suggestions written just for you by the folks who know the area best – Huntsville/Madison County locals. Trip Builder: As you are exploring the new huntsville.org, add the restaurants, attractions, hotels and things to do that most appeal to you to your own, personal Trip Builder. Plan your trip to the Rocket City ahead of time, and save your information for future use. Facility Search: Are you a meeting planner looking for 5,000 sq. ft. of meeting space and a convention hotel with 200 rooms for your attendees? Use the Facility Search Slider on huntsville.org to make your information quest easier than ever. Geo-targeting: Sort restaurants, hotels, and things to do by what is closest to you. All you have to do is allow your browser to geo-target based on your location. You can also use this feature to see the items you’ve selected in your Trip Builder on a map showing how close your “must-do” items are to one another. A product of Google, this geo-targeting map feature also allows you to look at a street view of those locations you are most interested in. Events Calendar: See what’s going on in the greater Madison County area by date, keyword or attraction. The new huntsville.org has a comprehensive events calendar tailored toward leisure travelers. What’s more, if you are thinking about planning a trip in the Fall, Winter, Spring or Summer, we’ve got all of the information you need on the festivals, concert series and other annual events that take place seasonally. Translation Services: The Rocket City is proud of its diverse, inclusive community. We welcome visitors of all backgrounds. The new huntsville.org translates into 65 languages, making this a truly world-wide information hub for the Rocket City.